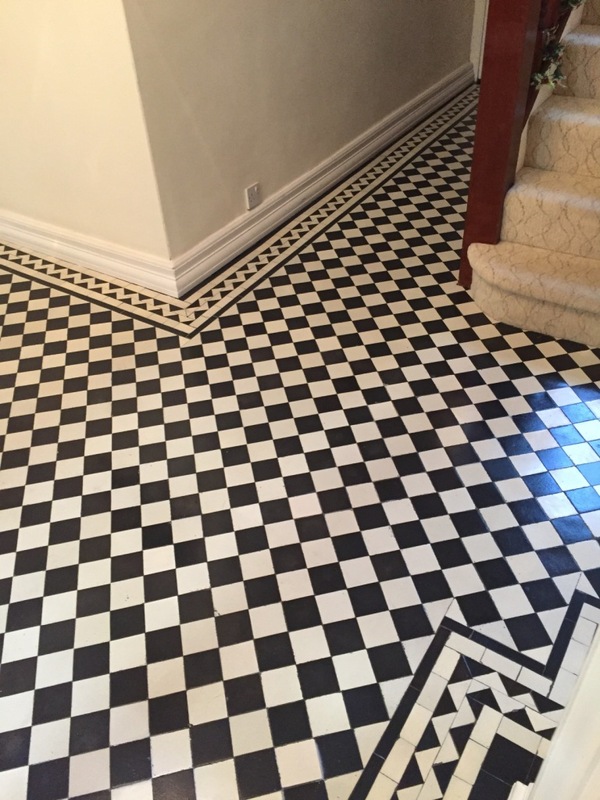 This 1930’s North London property in Mill Hill had a classic tiled hallway floor laid with black and white tiles in a diamond pattern and reminiscent of the Victorian era some thirty years earlier but still popular at the time the house was built. Mill Hill was first recorded as Myllehill in 1547 and appears to be named after a “hill with a windmill”. Over the years it’s merged with the surrounding towns and is now a desirable suburb in the North London Borough of Barnet. I first spoke to the owner of the property over the phone to get an idea of what was required and work out a convenient time to take a look at the floor; we often get customers looking for a quote over the phone but this is not always easy to do as you never know what problems you might find with an older floor until you get there. On inspection I could see there were in fact a large number of loose tiles in the central part of the floor which would need to be reset and grouted, the floor would also need to be deep cleaned and re-sealed with a suitable sealer to get it back to its former glory. I was confident we could soon get the floor looking how it should and after discussing the process, agreed a price and a timescale for the project. The owner was keen to get the job completed as soon as possible. Firstly, we prepared the area with protective polythene tapes to thresholds, carpets, and door fronts to ensure the surrounding areas were protected. 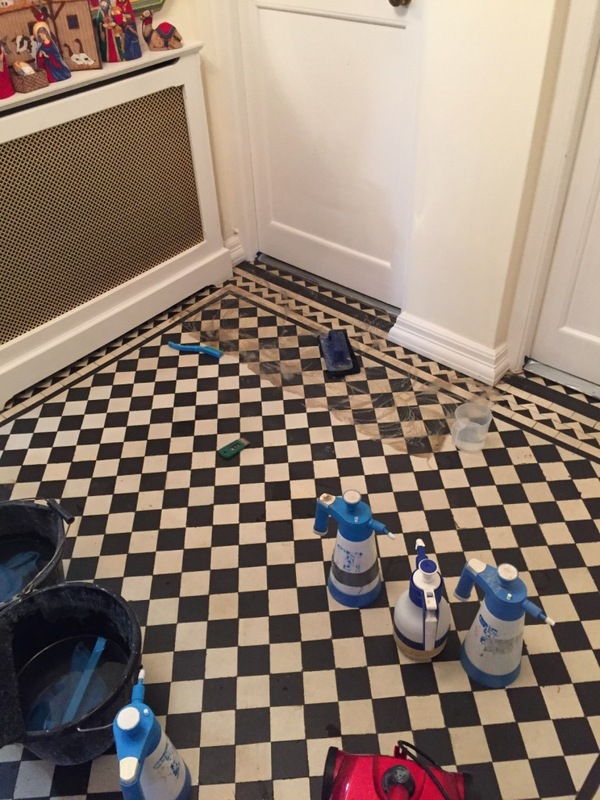 To clean the floor a strong dilution of Tile Doctor Pro-Clean was applied, this is a concentrated, multi-purpose high-alkaline cleaner, stripper and degreaser and is highly recommended for use on natural stone, tile and grout. The tiles were scrubbed with both floor pads and brushes, it is easier to use brushes in the more intricate areas. After the scrubbing we rinsed, and steam cleaned the floor, removing the slurry generated during the cleaning process with a wet vacuum. It was now nicely prepared ready for carrying out the repairs and the cleaning process was useful in identifying those tiles which needed extra attention. The repairs involved resetting 50 to 60 loose tiles, the process requires carefully removing the tile, scraping out the old adhesive and grout and then replacing with new. The area is cleaned and then when the adhesive has set the tiles are re grouted in a grout chosen to best match the original. Luckily there were no damaged tiles on this floor which made the job easier. Although, we can usually track down replacements when they are needed! We then left the hallway to dry off overnight, returning the next day we used a moisture meter to check the floor was dry and suitable for sealing. Old floors like these have no damp proof membrane fitted under the floor so can take time to dry out, fortunately we completed this work during warm weather, so all the readings were good. Victorian style tiles are quite porous, so we found we need to apply give coats of sealer before they were fully sealed. We selected Tile Doctor Seal & Go to seal the tiles, it’s a specially formulated water-based blend of acrylic polymers that adds a durable stain resistant surface and leaves an appealing low-sheen finish. Being water based it doesn’t leave a smell as it dries, and it also a breathable sealer that can cope with the lack of a damp proof membrane ensuring moisture doesn’t become trapped under the floor. The client was very happy with the completed job, the work took a day and half to complete. Considering how many tiles had been loose the job had turned out very well. The floor is now much more manageable for her and the hallway tiles life has now been prolonged. 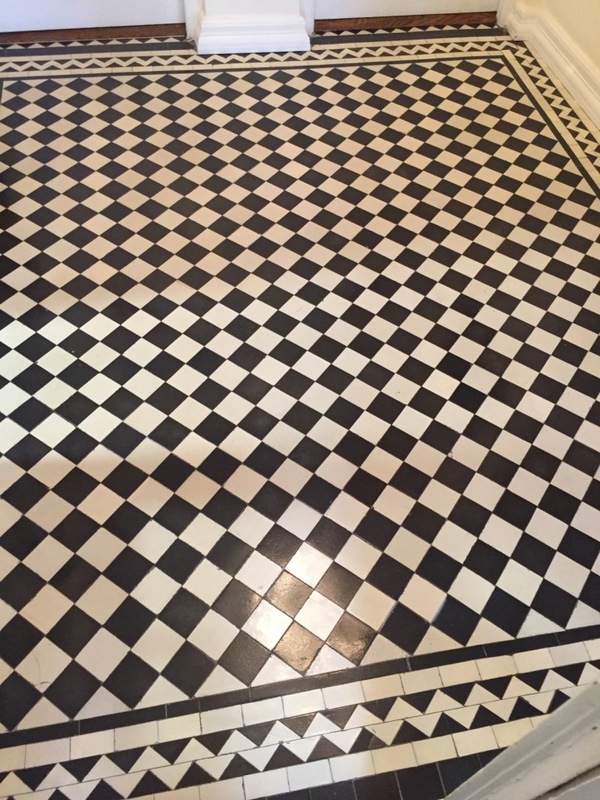 This entry was posted in Victorian Posts and tagged Barnet, Black and White, Diamond Pattern, hallway, loose tiles, Mill Hill, north london, Tile Replacement, victorian tiled floor by AbzDominise. Bookmark the permalink. Covering North London, Nigel Voyce is an agent of Tile Doctor, the largest Tile, Stone and Grout restorative cleaning network in the UK who have developed the products and techniques to handle a multitude of issues surrounding tile, stone and grout restoration.